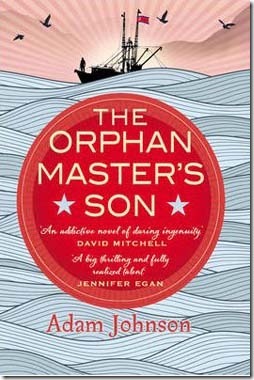 Adam Johnson's The Orphan Master's Son is a novel set in North Korea. After reading several non-fiction books about life in North Korea, I have become completely fascinated with the country and how people make their lives there. Johnson's novel brings a new take on that country to life - it is about the people there who know that their Dear Leader is a corrupt liar, but do their best to improve their lives and those of their loved ones. Jun Do grew up in labor camps and then became a kidnapper, stealing people from their lives in Japan to become teachers, singers or other workers in Korea. He's good at his job and rises through the ranks quickly, shedding previous versions of himself so that no one ever really knows who he is. As he gets closer and closer to the Dear Leader's inner circle, he wants more and more desperately to get out and to get his family out, but struggles to find a way to do so without endangering everyone. The narrative of this story was difficult for me to follow sometimes, probably because I was reading it on audiobook. The perspective would shift from one character to another, and the timeline would move back and forth and characters would change facts to tell a story that was far more likely to get them off lightly than to tell the truth. Usually, this would involve triple rainbows in celebration of North Korea, or about starving Americans being helped by beneficent Koreans. While I enjoyed the audiobook version, I think I would recommend this one to be read in written form to decrease the amount of confusion (though it seems like people who read it in print also struggled with the shifts). There was a lot of brutality and propaganda and unhappiness in this book. It was tough to read. But I really appreciated Johnson's humanization of all his characters. Jun Do does horrible things, but he also inspires trust and loyalty in the people who are closest to him. He tries his best to stick to a moral code in a country where there really is no moral ground, just whatever the state decrees. It's easy to think about North Koreans always turning each other in and reporting each other's activities to authorities and living completely paranoid lives. But within that system, friendship and love and loyalty do still exist, and Johnson brought that very much to life. I also liked how Johnson brought some humor into this book, though it was a bit of bleak humor. The second half of the book has three narrators: Jun Do, his interrogator, and the North Korean radio broadcast. All three of them are ostensibly telling the same story, but they tell it in completely different ways. It's fascinating to see how the interrogator draws conclusions based on what he has been told and what he's found out, and how that stacks up against what Jun Do really did, and how all of this is warped into a story by North Korean radio to either laud or revile the parties included, depending on how the government wants to sway things. I think sometimes my confusion over the timeline and narrators kept me from loving this book as some others did. While I liked Jun Do, I didn't really care for any of the other characters. And the narrators in the book are quite unemotional. Which I think is the point - I get the impression that North Korea is not a country known for excessive emotion - but it made the book a little monotone. However, there are only so many books on North Korea out there! And this one definitely brings nuance and breaks new ground. Sounds like a no-go. Too bad since it is such an important and little publicized topic. I just finished, and was unenthusiastic about, Guy Delisle's graphic memoir about his time in Pyongyang, so I was thinking about reading this because I was interested in the country itself. The structure sounds like the kind of thing I might like, if I don't find it confusing, so I may save it for a time when I don't feel easily distracted. Are there other books about North Korea you particularly recommend? I was also considering Nothing to Envy. Nothing to Envy is amazeballs! I highly recommend it. I think the structure of this one might work better in physical format - for me, it was confusing, but I assume the spacing and such in the book helps to make all that clearer. I agree with you on Pyongyang. The more Delisle I read, the more I think he is kind of a jerk.